As many of you are aware, there have been massive protests with regards to students protesting the cost of an education in Quebec. Quebec has the lowest tuitions fees in all of Canada, about 1/3 of the costs in Ontario. Let me get the simple things out of the way first. Am I for a free education, of course(with some reservations), do I approve or even support these spoilt little brats in the methods HELL NO. Students Tuesday morning halted Montreal-bound incoming traffic on the Champlain Bridge for more than an hour. They were protesting the Quebec government’s plan to hike tuition fees. I think education is something that should be free, that everyone from every walk of life that are local residents and paying their taxes should be able to receive. I qualify this statement, to the extent, that paying for residents is one thing, as their tax money (in theory) goes back into the local economy (province, country, etc). We have some very well renowned schools, and offering free education to outsiders will rack up a bill we cannot afford. My main issue against free education, is that it currently helps weed-out the perma-students. The people who just get degree after degree ( not furthering their education, just adding to it ) at the expense of the rest, or take extreme amounts of time to complete their degree because taking 4 classes is too hard and cuts into partying time.. Its not a sampler menu, where you should be able to pick up 5 different degrees, or take 10 years to do a 4 year program. I remember a guy I went to CEGEP with, he was in his 7th year at the school, on a 3 year program. Back to the matter at hand. Something i really REALLY don’t understand with these student protests, is if you are trying to gain support from the masses, why upset them by complicating their lives. If you want the workforce to pay for your education, why stop them from being able to go to work? 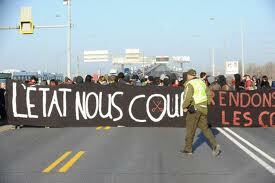 On Tuesday March 20th, they blocked the Champlain bridge trapping drivers on the bridge. The riot police had to be called in, and 97 fines were issued to the amount of 494$ each. 494$ is more than they want to raise tuition, what’s the point? The one thing i don’t/can’t seem to understand, is why Quebec has some of the highest tax rates, where is all the money going, its not health care ( hospitals closing down, etc), its clearly not going to road repairs, and we can now say its not going to free education, where or where has our tax money gone.